Two small boys, a husband and a renovation project: Don’t use that.....toilet! We’ve had a family bonding session over DIY this weekend. 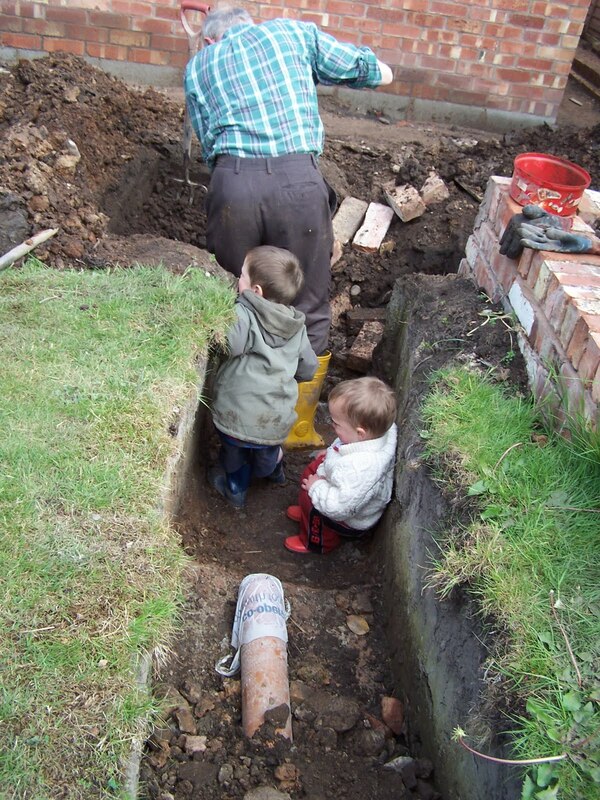 My parents came down to free us both up to work on the house but what happened in practice was that Project Manager and my dad worked on the house whilst mum and I kept the wee boys amused. I was supposed to be DIYing but I had a Klingon child all day Saturday. I was slightly concerned about my dad as he seemed to start work at 110% and keep that up until morning coffee, 110% until lunch then 110% until tea. He has had a hernia reasonably recently – luckily not whilst in employment at our house! Then he went up into the attic to lift the old insulation and I could hear him sneezing and coughing – he has terrible hayfever. I adopted the bossy daughter persona and told him to come out of there – but by that time he was finished. The force of my parents has removed the hedge, completed the soakaway hole, put new beams in the attic, knocked the bathroom door through, plastered out the hall, and eaten us out of house and home!! Mum and I spent some quality time removing the old tiles and plaster from the bathroom (new hall) wall. Project Manager said there was way too much giggling but it is lots of fun just having free-reign to hit things until they fall down. We finally have doors and windows in all the right places. Unfortunately it’s not the end of knocking down walls but it feels great. The wee boys were able to get to their bath without being passed through a hole in the wall for the first time in weeks. Unfortunately, biggest wee boy was in such a rush to get to the toilet before his bath that he had done it in the new-as-yet-unconnected toilet before I could stop him!